Safdarjung tomb was built by Nawab Shuja-ud-Daulah, the son of Safdarjung. Safdarjung was the governor of Awadh and later became the Prime Minister of Muhammad Shah, the Mughal emperor. 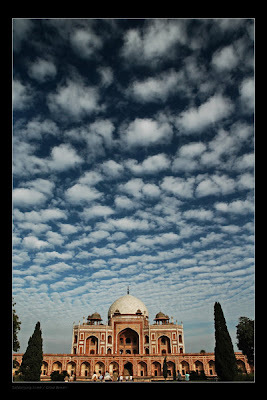 Built in 1753-1754, the Safdarjung tomb lies at the Lodi road, New Delhi, India. Safdarjung tomb is set in the middle of a garden, which spreads over an area of 300 sq m. The garden of Safdarjung's tomb is laid down on the pattern of the Mughal Charbagh style. Safdarjung tomb represents the last phase of the Mughal style of architecture. The tomb of Safdarjung was built in red sandstone and buff stone. There are two graves here, one of Safdarjung and the other apparently his wife's. The square central chamber of the mausoleum is surrounded by eight rooms all around. All the apartments, except the corner ones are rectangular in shape, the corner ones being octagonal. The dome of the tomb rises from a sixteen-sided base. On either side of the Safdarjung tomb are beautiful pavilions, known as "Moti Mahal" or the pearl palace, "Jangli Mahal" or the sylvan palace and "Badshah Pasand" or the emperor's favorite.